Happy Halloween everyone. I decided to leave the horror comics behind for this last post of the month and move back over to a superhero title. I was mulling over what to write about for this last post of October, and as I was riding around my neighborhood, I noticed all of those carved pumpkins lining the steps and walkways of many of the houses. That got me to thinking of reading Spider-Man comics when I was a kid and seeing the character Jack O' Lantern. I thought that was a good enough character to write about, and still keeping wiht the Halloween theme for the month. To me, Jack O' Lantern is more of a Spidey villain than he is anyone else's in the Marvel Universe, but he makes his first appearance in this comic, doing battle with Aaron Stack, otherwise known as X-51 and Machine Man. There have been a few people to take up the name of Jack O' Lantern, but I'm only going to talk about the original in this post. I'll probably get to the others at some point, but I have no idea when that might be, but for now, on with the show. Before he became Jack O' Lantern, he was CIA agent Jason Macendale. His superiors found his tactics to be too brutal, and he was let go from the agency. He eventually became a freelance mercenary and became the villain that appears in this issue. When we meet Jack O' Lantern, he is with this gang of thugs making plans to hijack and take over a prototype, state of the art security compound. His idea is to sell the plans to the highest bidder. However, Machine Man just happens to be there and ends up saving the day, but not without consequences. His co-workers learn that the man they knew as Aaron Stack is really a crime fighting robot. Stack leaves his job, and basically walks the Earth like David Carridine in Kung Fu. Jason Macendale would eventually become Hobgoblin and is responisible for the death of Ned Leeds. He is the man that hires the Foreigner to track down and kill Leeds. So, even though Jack O' Lantern isn't an very popular villain, the man that originally took up the mantle plays a pretty big role in the life of Spider-Man and the people around him. This issue would also mark the end of Vol. 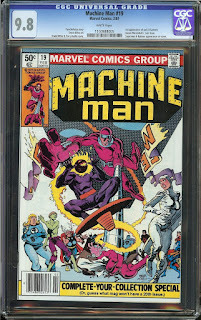 1 Machine Man series. What the actual reason is, I'm not sure, but I can only assume that it was from poor sales. He would get another series of his own only a few years later in 1984. If that wasn't enough for you, it's also got a great Frank Miller cover and Steve Ditko art all throughout the interior. That's two legendary comic artists for the price of one. Since Jack O' Lantern isn't a very popular character, CGC census numbers are quite low. But don't get the idea that this is a rare book. I'm sure there are a ton of copies stuffed into long boxes all over the country. This is definitely not a hard comic to find. You can find a multitude of raw copies almost anywhere you look on the internet. Since I brought up the CGC census, let's look and see what's on there. To date, there have only been 89 copies graded. Like I already said, don't let that fool you. The CGC census can create a false scarcity for key issue comics that aren't on everyone's radar. That only means that no one is sending in there copies to be graded. Anyway, a lot of the copies that have been graded are nice high grade copies. There are 57 copies graded between 9.4 NM and 9.8 NM/M. So, if you're looking for an already graded copy, there are a few out there to choose from. You may even find a CBCS or PGX copy too. If you do decide to go already graded, don't expect to break the bank either. The latest eBay sale for a 9.8 NM/M dropped for only $134.48. The listings that I saw were grossly overpriced if you compare it to these sold listings. There are a couple of auctions at that grade on eBay right now that have Buy it Now options for well over that last sale. 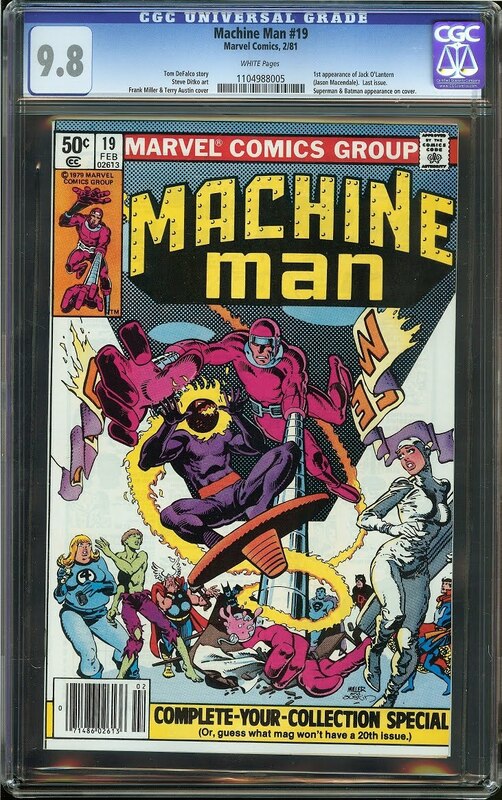 If you've got a good grading eye, you may want to take a chance on one of the many raw copies that are out there, or you can wait till you find one that is in your price range. Either way, this is a very affordable key issue you can add to your collection. Have a safe and Happy Halloween everyone.